You know I've been excited about the newest little Royal. I think King George is a great (future) name and title. I'm proud of my 1/4 English heritage so I claim little George as our future king. In honor of George I drew up a little pram block. This is the rough draft of pram 1. This is a rough draft of pram 2. I prefer pram 1. I'm thinking I may try another rework. However, I wish I hadn't used my cute red crown fabric on my trial versions. The fabric is vintage and I have limited yardage. Sorry I've not been visiting blogs hardly at all lately. I am really mourning Google Reader. I am not really lovin Bloglovin at this stage. 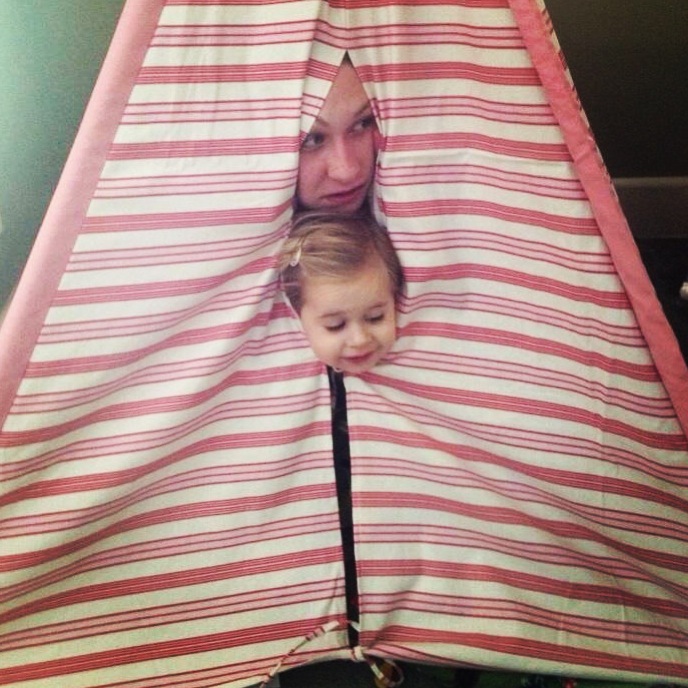 I can't leave comments on blogs that aren't with Bloglovin. The format is annoying I think. Or maybe I just hate change. Either way it makes visiting blogs tough going for me. One of the best parts of having a blog is connecting with women like me. I've met some wonderful women over the past 6 years. I'm so grateful one of those talented and amazing women is Thimbleanna. Anna's blog was one of the first few I read way back in 2006 (? has it been that long?) We live states apart so we don't get together that often. I was excited she was visiting Utah this summer and I am so glad our schedules meshed together. My daughter Shelbie went to lunch with Anna and me. Shelbie took this picture and told me I didn't stop talking so most of the photos were crazy shots of me. It is good Anna was focused. 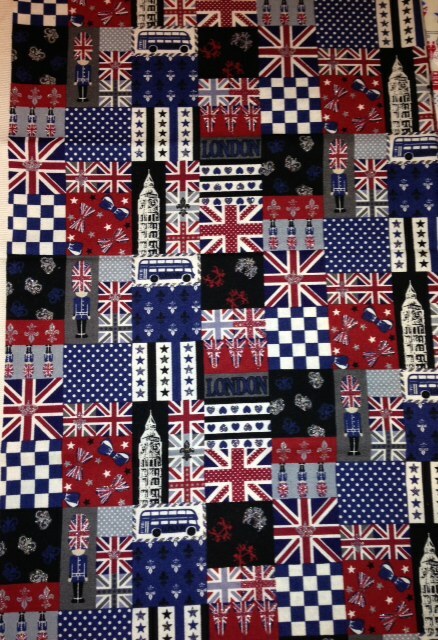 I brought my London 2012 quilt to show Anna. I was so flattered she wanted to see it. I have always admired Anna's bunny pincushions. They are legendary. 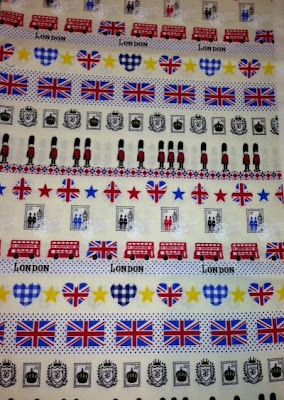 This one was made especially for me as I embark on my London 2013 quilt. Thanks so much Anna! We had lunch at my favorite lunch eatery in Draper, Utah. 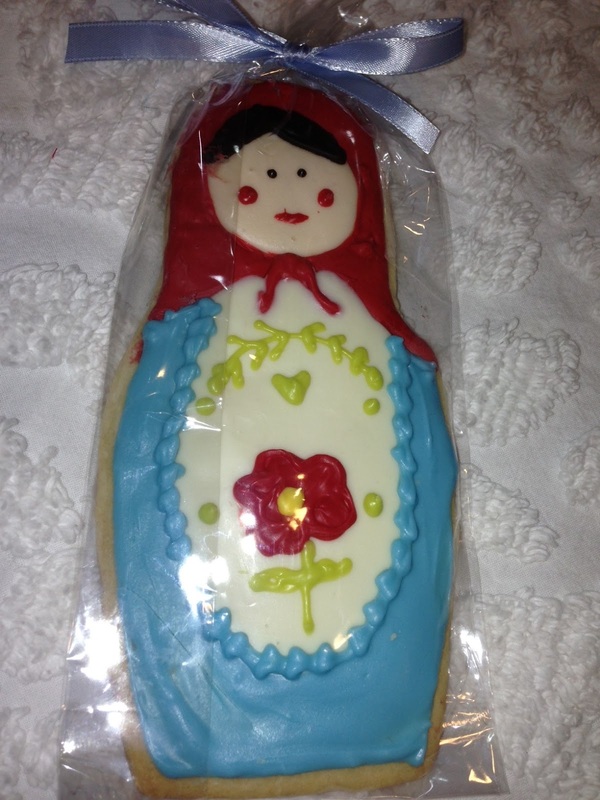 We couldn't leave without a couple matryoshka cookies. Too cute to eat. It was a great break for a Saturday afternoon. Over 2 months ago I posted about my new irons. You can read the post here. 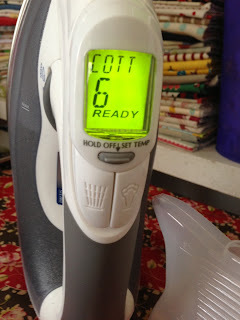 Now most of you know an iron is one of a quilters top 5 most important tools. Right? 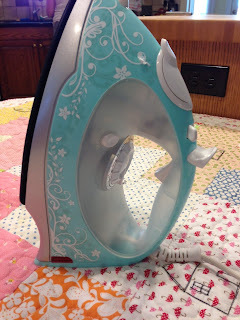 So this cute Hamilton Beach iron is not a quilter's iron. It would be good for the sometime user that doesn't need a solid heavier weight iron. I have it with my bigger ironing board so my kids can press clothes, when needed. Light use only. 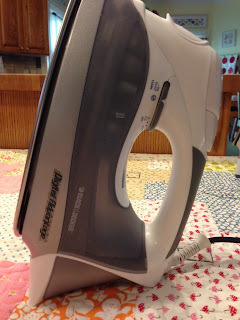 I'm very happy to report that I love my Black and Decker Digital iron. I think it is my most favorite iron, ever. I've probably had more than 15 irons in my lifetime. Thanks again to Lynn, Beth and Kati for recommending it. I really like using this iron. The B&D is an 'instant on' iron but you can also turn it completely off. You can't always do that with today's irons. I like the digital display feature for my old girl eyes. One of my very favorite features is that I can dial on the amount of steam I want to use from none all the way through heavy steam. My only complaint is that the burst of steam button is on the right side of the thumb feature (above). I don't use the spray function much so I wish these buttons were switched since it is slightly awkward. I like how much water the iron holds. I like the weight of the iron. And it is priced well at around $50.00. I'm extremely happy with my purchase. Now we will see how long it lasts. This is my 2nd (and final?) STAW quilt. You can see it is almost finished. The right lower binding just needs a leeetle more hand work. Things are going on around here so my time to bind is sorta limited. 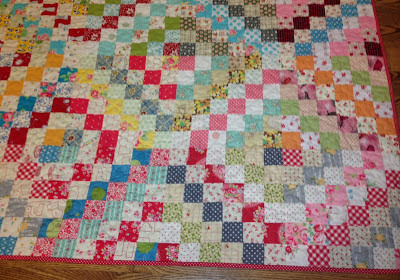 And my granddaughters always come before sewing, but I absolutely will get this quilt done soon. I really like he small green gingham binding (Lakehouse). It really works. The back is a cream flannel. When the quilt is bound, I am going to wash it ASAP. 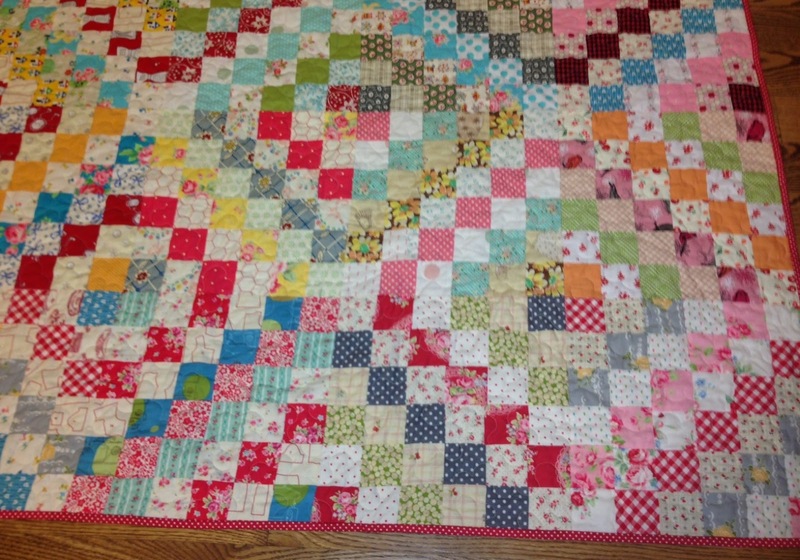 It will be a such a warm cozy bed quilt. 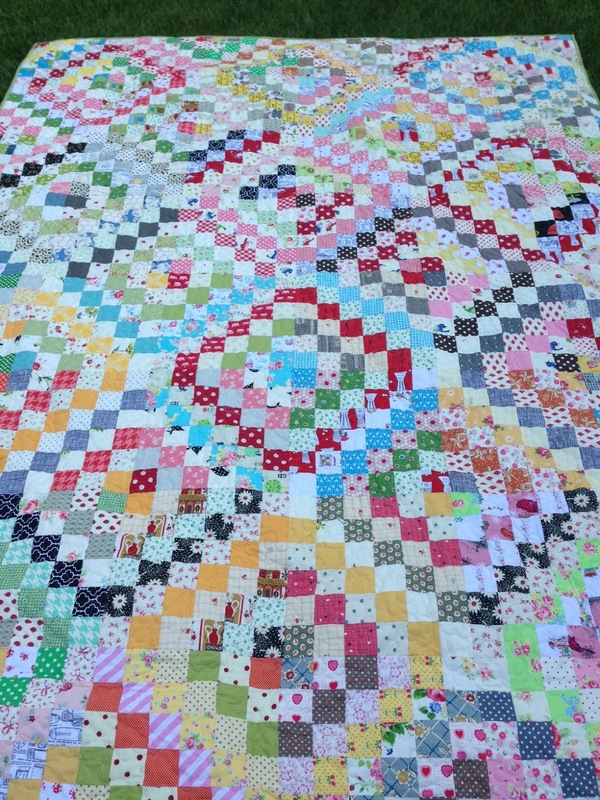 I'm grateful to Bonnie at Quiltville for bringing us all into the project. This has been a great scrap buster for me. 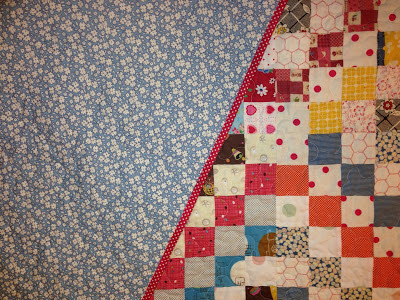 I am so happy about my scrappy lay out for this quilt. 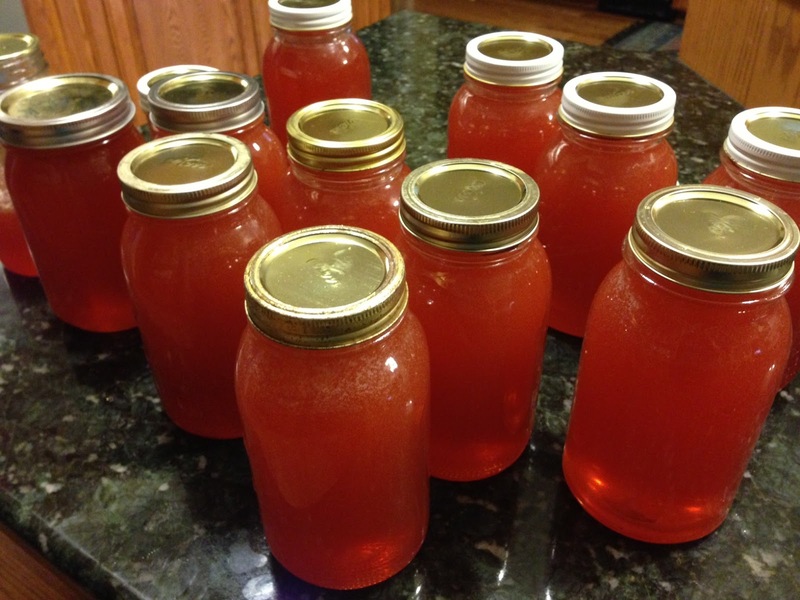 The honey part of the title in this post came when Mr. Hive and nephew Bryan extracted the first batch of honey from our new bees. I don't know if you can really tell but the honey is pink. The birds pecked cherries from our pie cherry tree and then the bees feasted on the left overs. Those darn birds. But it makes for some interesting honey. It is like a sweet but slightly tart taste. It is definitely a different honey flavor. I think they got about 3 gallons of honey from the hive. Pretty cool. 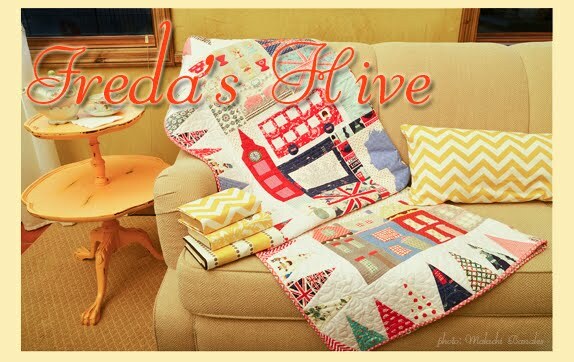 Stay posted to see what events I'm so busy with at the Hive. 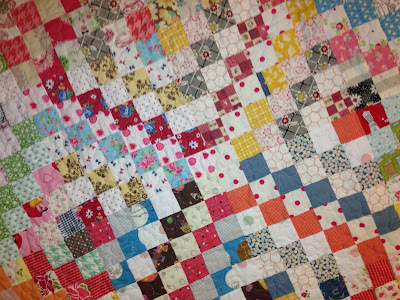 The quilt above is a quilt I dreamed about, literally, more than 10 years ago. 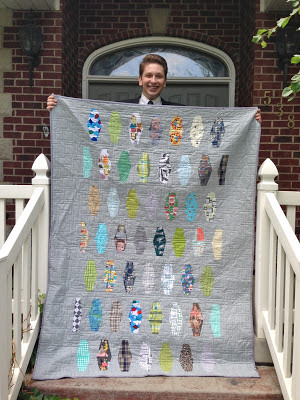 There are lots of spool quilt patterns out right now but I had only vaguely seen one spool quilt similar to it in my past. 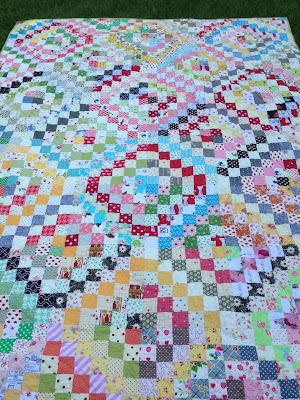 The quilt is obviously so full of many fabric patterns and colors from my scrap bin so I think it fits the category of scrappy. 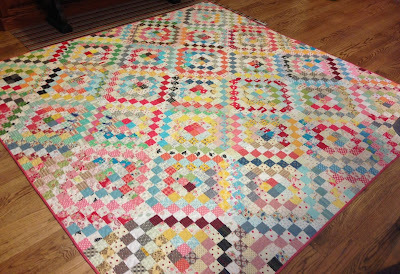 I was pretty excited to make this quilt so I even put a tutorial on my blog that you can still find HERE. 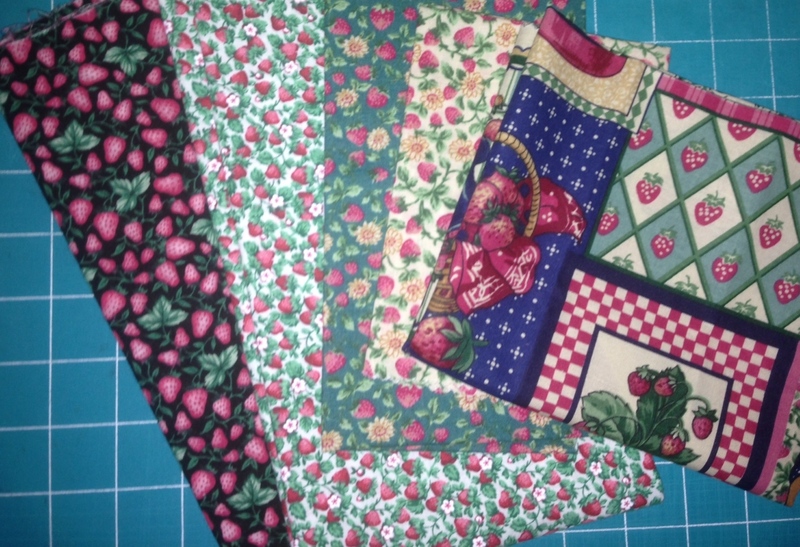 At the time I made this quilt I was keeping smaller pieces of fabric than I save now. 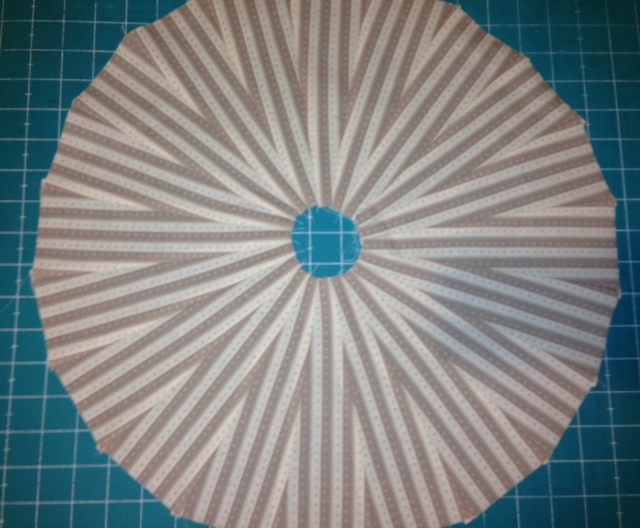 And the small strips fit for the look I was going for of a variegated thread look. 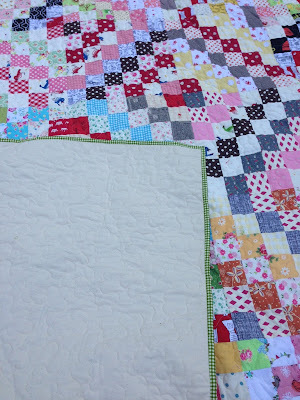 Emily asked me to answer some questions about my scrap quilts and I'm happy to give you my ideas. 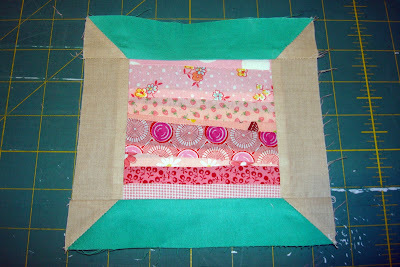 I usually only save scraps that are 2.5" square or larger. I just can't manage my scrap stash if I keep pieces smaller than that. However, for some projects like this one, I make an exception. I really prefer to make larger projects when working with scraps because I don't feel like I make a dent if I don't go large. 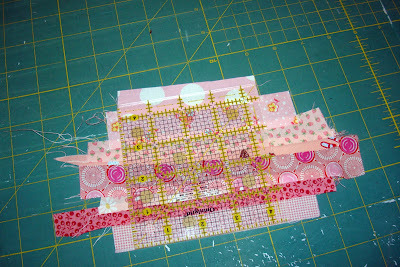 And when I'm working with scraps, I always feel more is best. 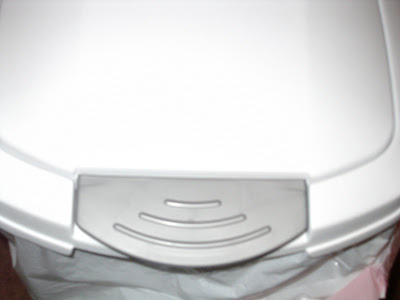 I purchased a clean new trash bin with a lid and I keep a trash bag inside to house the scraps. I house the scrap bin under my cutting table so I can easily drop pieces of fabric into it while cutting a project. This is an old picture from years ago but you get the idea. 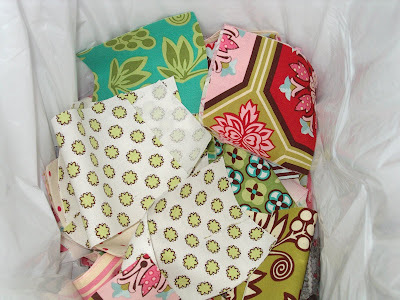 I keep my scraps inside and then when the bag is full I can pull the bag out and go through scraps and use them. Sometimes I give the scraps to my niece Tricia. It is nice to give them to someone that appreciates them. 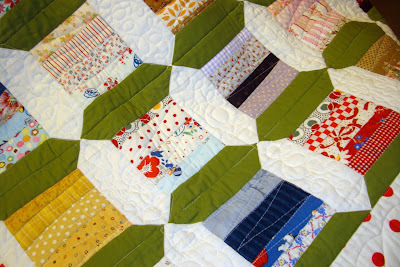 This block really was fun to make because each of the blocks felt like little tiny quilts. 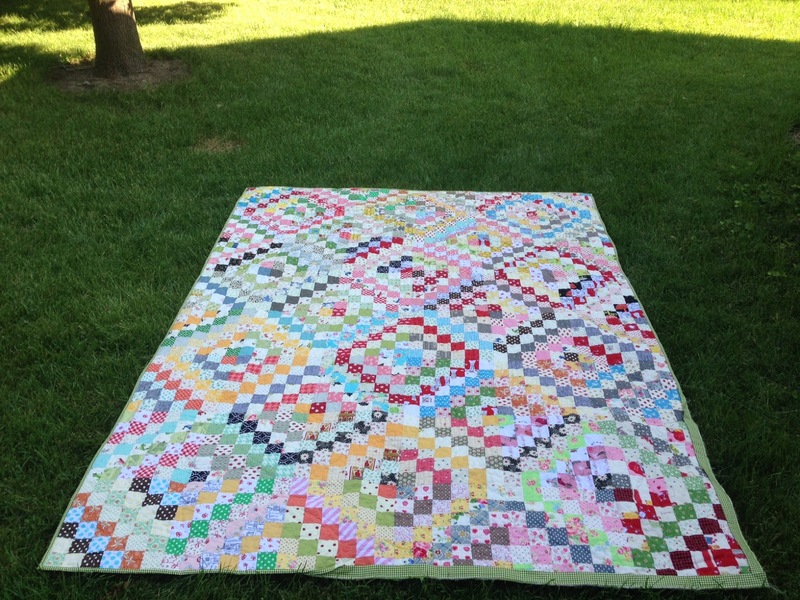 My quilter, Wren Woodland, quilted a back and forth thread design to enhance the project. I chose the olive color for the spools because I remember my mother had some vintage wooden thread spools that were just this color. 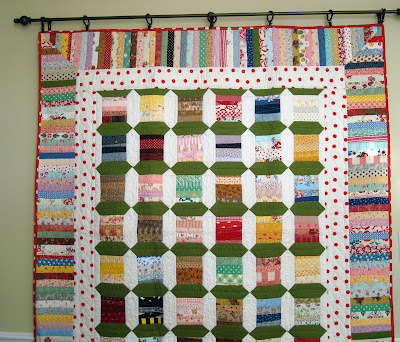 I really like this pieced piano border. It is one of the few times I've mitered my edge. I'm quite proud of that. 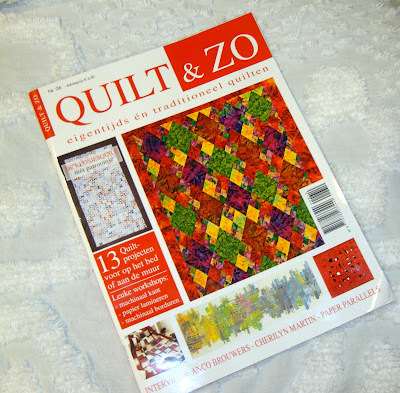 I'm also proud that my string spool quilt was published in a magazine called Quilt & Zo (sew). It is a magazine from the Netherlands. 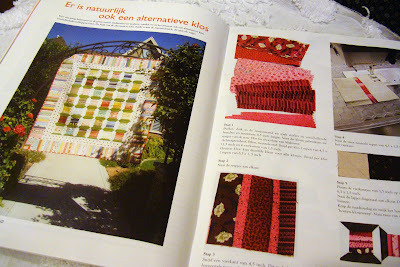 It is always very flattering to have a quilt published. I really like how they presented the article, too. It is a great magazine. 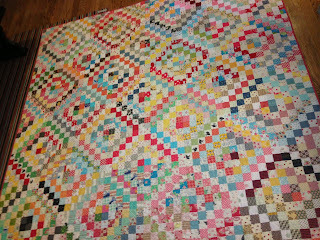 I really love scrap quilts. I'm sure you can tell. 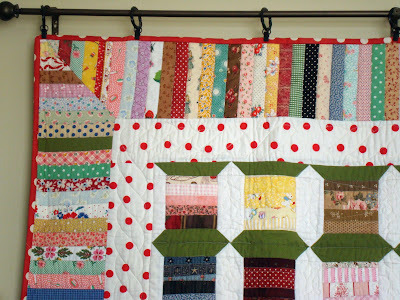 The patches of fabric kept me company in my childhood bed and that was the beginning of my love of fabric. Emily asked me to make a general scrap suggestion. My suggestion would be to limit your scrap heap because they can take over your sewing area and make it cluttered and messy. 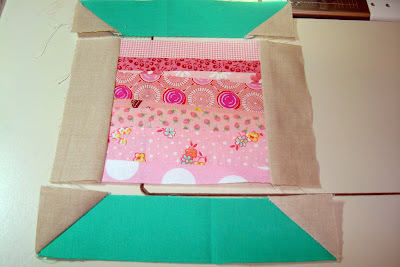 Scraps by nature are messy so keeping them contained and limited is a good idea. I know it is hard to part with fabric at today's prices but if they overwhelm you it becomes a battle of guilt. 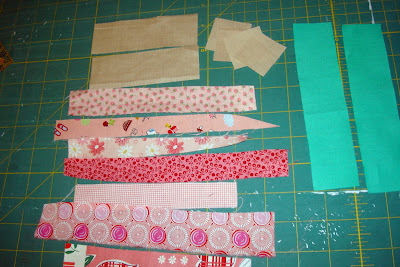 Choose a scrap size you will keep and part with the rest. Then do it with no guilt. 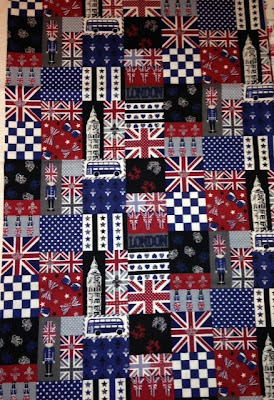 Last year I made the London 2012 quilt in the header of my blog, above. 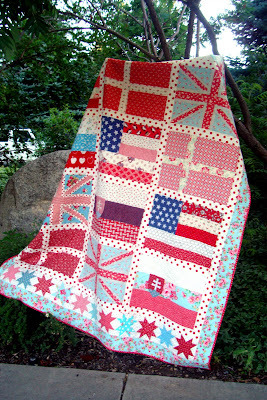 I loved making the quilt and I blended the Olympics with the Queen's Diamond Jubilee. That quilt is a "one of" and I never intended to make another one or draw up a pattern for it. But, I've changed my mind. 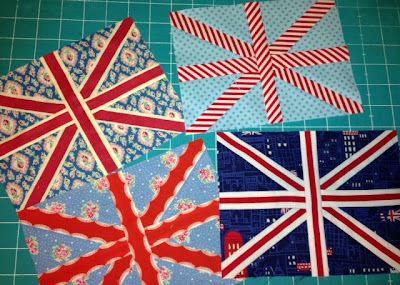 With the Royal Baby coming any time now, and so many lovely compliments and questions about a pattern for my London 2012 quilt, I decided to make a new London 2013 quilt. This new quilt will have some changes. 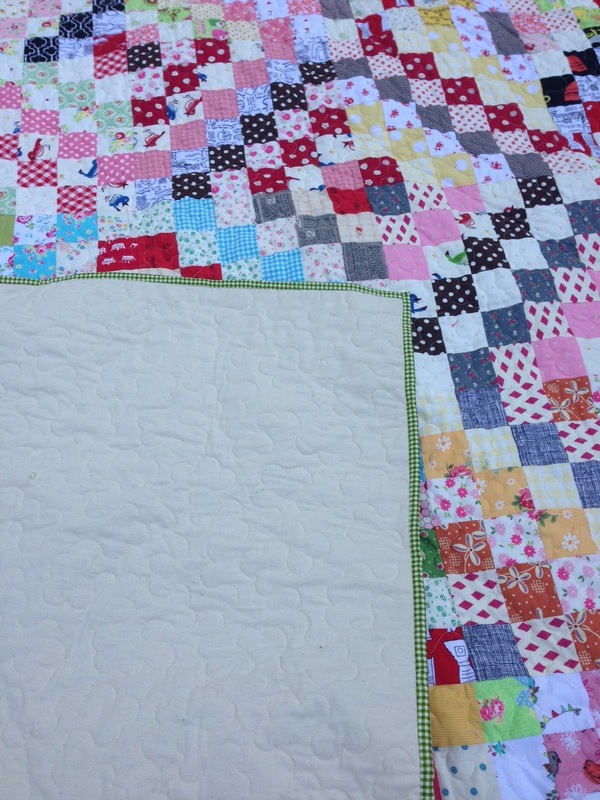 I'll incorporate things I've learned to do better, and different blocks to make the quilt all my own. I'm redoing the London Eye. Here is my work in progress, above. 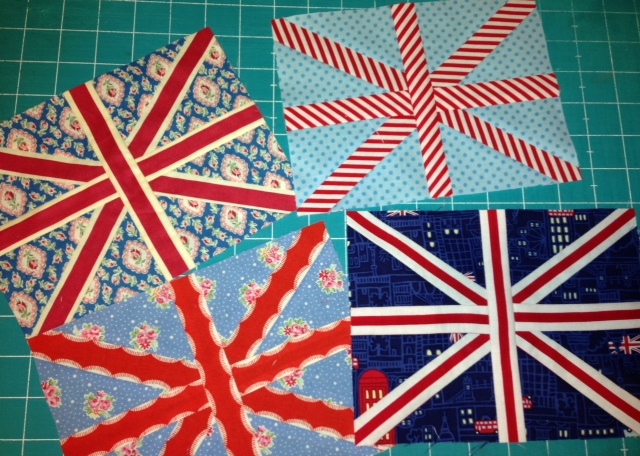 I've had so much fun making flags and I've changed up my Union Jack to make it just a little simpler to make. The latest London fabrics out there also pulled me back into this project. There is just so much inspiration for me. It was exactly year ago I was making London 2012 and as soon as it was done I missed making it. So it is really fun to change it up and make it just a bit different. I wonder when that baby will be born??? My friend Sandi is one of the most generous, serving, and loving people. She is always doing things to serve her community, family and everyone she meets. She's a great example to me. 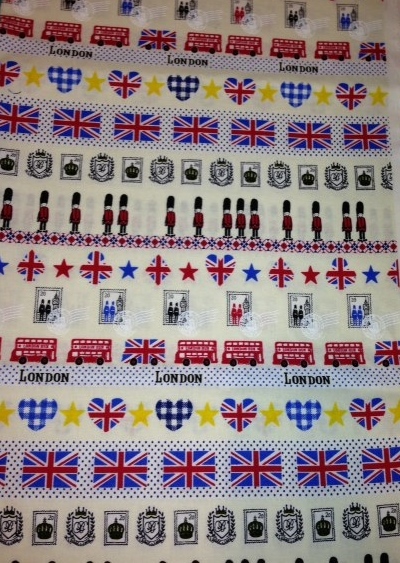 Recently I received a package from Sandi with fabric that is pretty special. Sandi was the caretaker to her friend Cindy's fabric. You can read about it HERE. 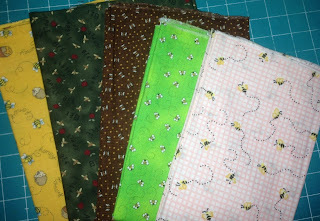 And Sandi is sharing Cindy's bee fabric with me. The bees are really cute. The pink gingham is my favorite. There was also this strawberry fabric in the box. I love love strawberries. Do you ever wonder what would happy to your stash if you passed away? I think about that sometimes. Sometimes when I'm working with vintage fabrics I like to think I'm making the original owner of the fabric proud. 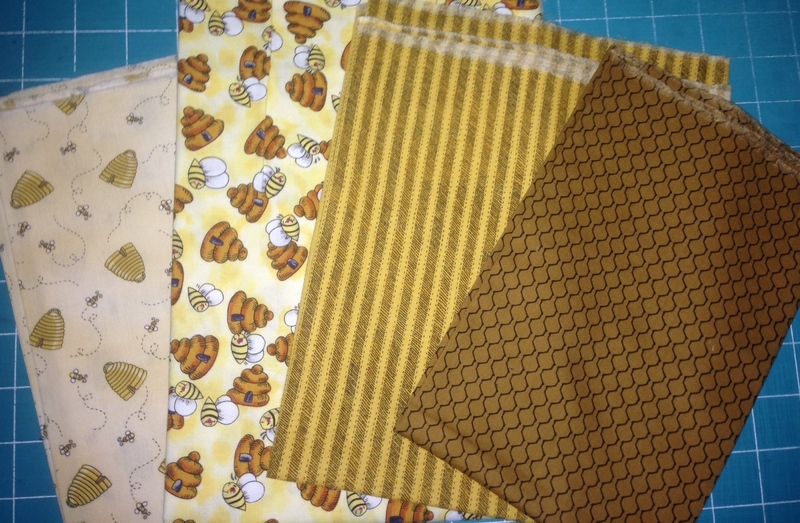 There was also some great hive fabrics in the box, too. I enjoy everything bees and hives, of course. And I'm always thinking of new projects I can make bee themed. I'd like to think Cindy knows her fabric is being enjoyed and that Sandi has done a great job with the honor and responsibility of taking care of the fabric stash. Thanks so much for thinking of me Sandi. Sandi always thinks of my 2 granddaughters and she sent these stickers for Allison. 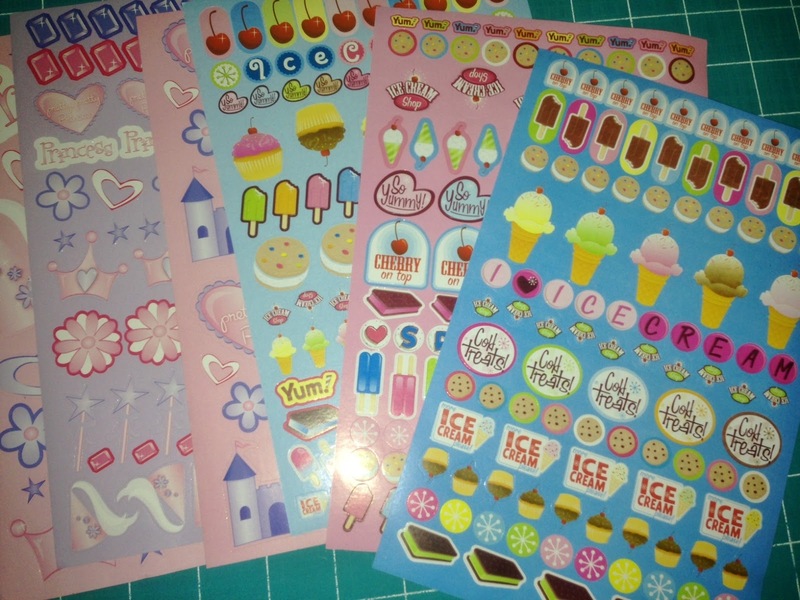 I'm going to use them this weekend when I spend time with the girls and play stickers. Happy weekend all. We have rain here - much needed. I love the rain. Most of my regular readers know I am the mom of 7 daughters and 1 son. My son Mason is the youngest. Crazy, right? I know. What was I thinking? Mason is really kookie, self confident, witty, cute, smart, quick, and generally a great kid. Don't tell him I said that. His head is big enough. Mason has always been so gregarious. Even as a little kid we would walk through the grocery store and he'd know people I didn't know. They would say: "Hi Mason" and I would ask "Mason, who was that?" 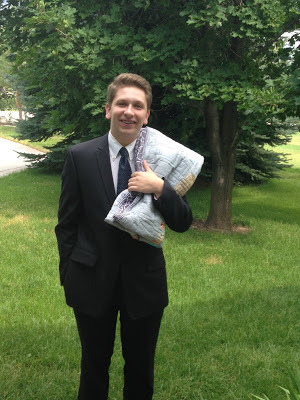 Here is Mason posing (reluctantly) above with his high school graduation quilt hung over his shoulder in typical Mason "swag (er)". 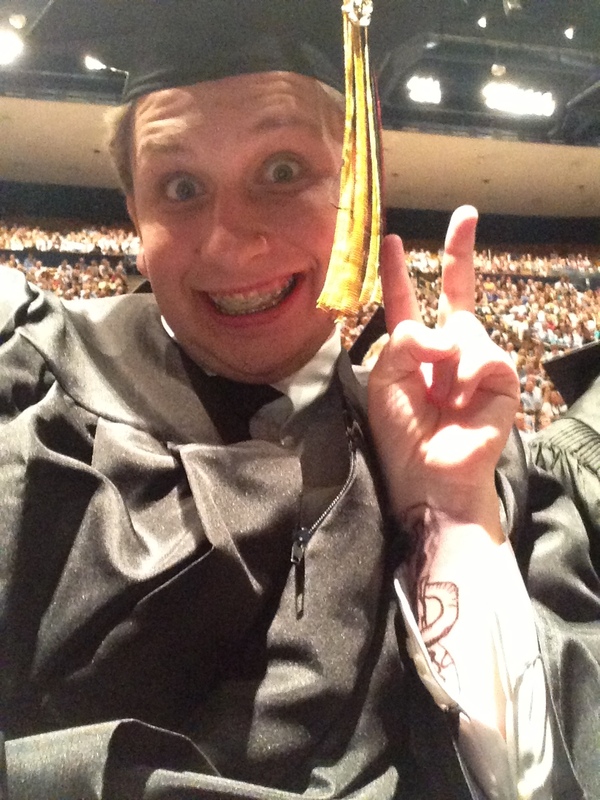 I really can't believe I got my last child through public school! 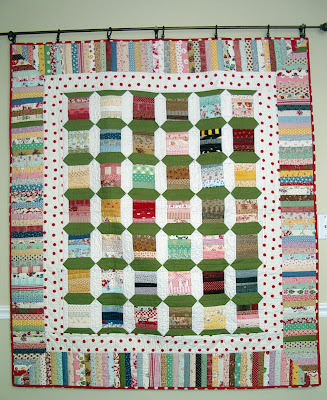 When I thought about making Mason a quilt my daughter Laurie gave me lots of ideas. She told me not to make it like a regular quilt but make it full of crazy personality like Mason. So I used Lori Holt's rulers to make a personality lantern quilt. Many of the fabrics used are connected with some odd or silly thing he has done or something about him. Above the CTR fabric is for "Choose the Right". 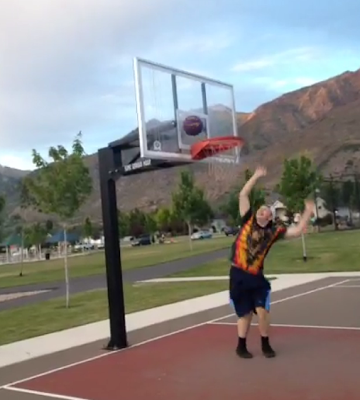 Mason is preparing to serve an LDS mission and tries to live the standards of our church. 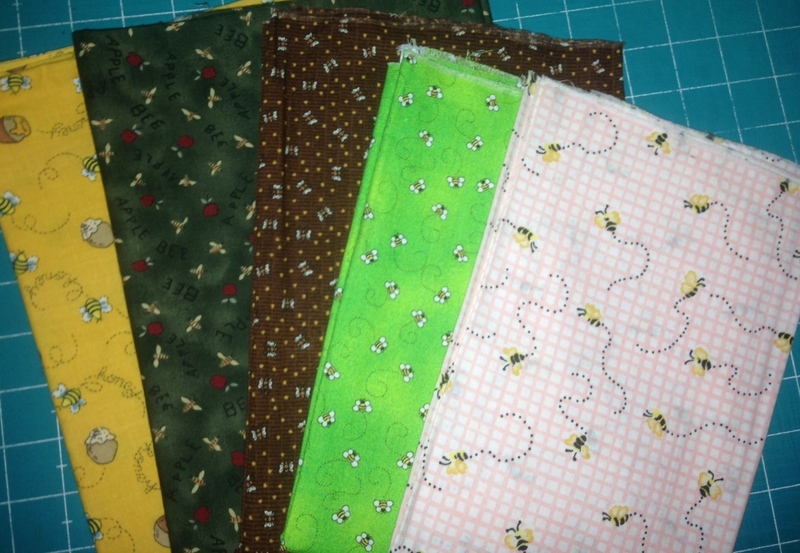 There is Mason jar fabric, video game fabric and you will notice the doll fabric. Mason has played many pranks with dolls (I mean he has 7 sisters). One was an homage to an SNL skit with cut off doll arms sticking out of the sleeves of his sweatshirt to look like he had doll hands. 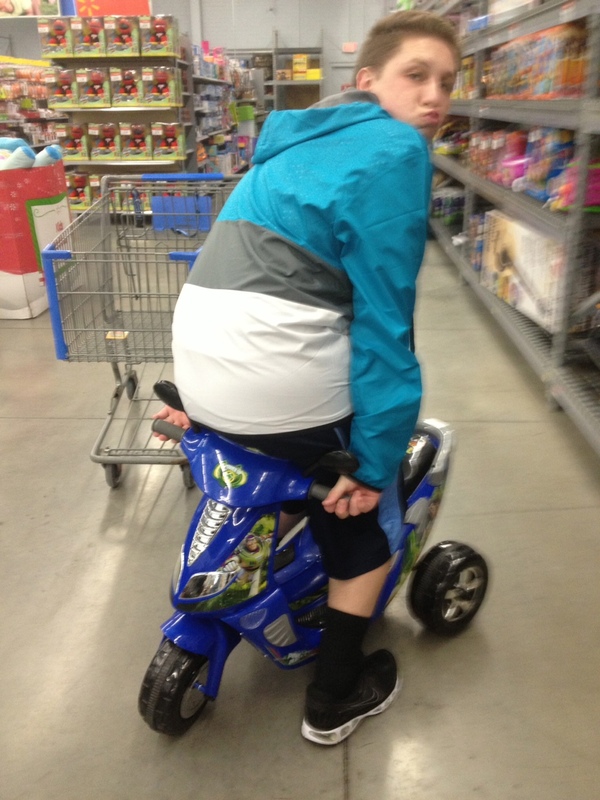 Oh Mason. And he took the doll hands to scout camp. Screenshot from a crazy mason vine where he shows off his (lack of) basketball skills. (He is wearing a thrifted weird shirt. Never afraid of going to Deseret Industries with his friends to pick out odd outfits, I will say he didn't require a pricey wardrobe. Photo bombing his sister Chelsey. Showing off his crazy, crazy, crazy thrift shop clothes for a school occasion to my granddaughter Allison. (He doesn't even wear glasses. Shaking my head.) 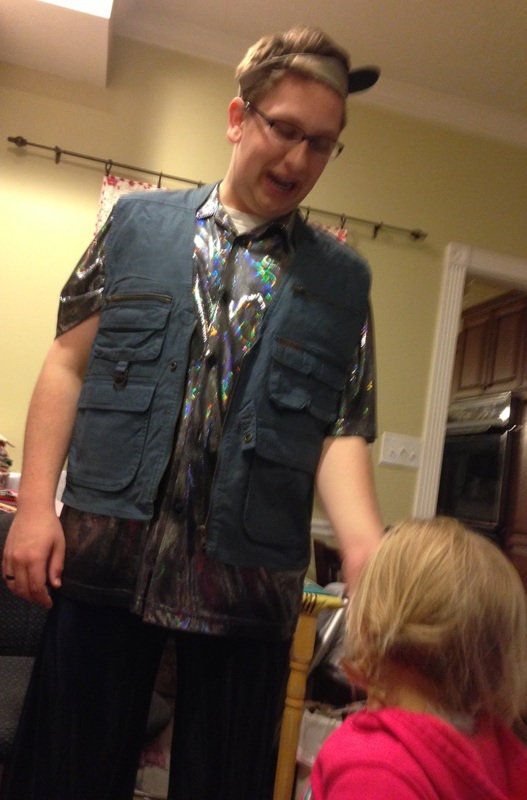 The shirt is silver lame' I think. He's a very good uncle. 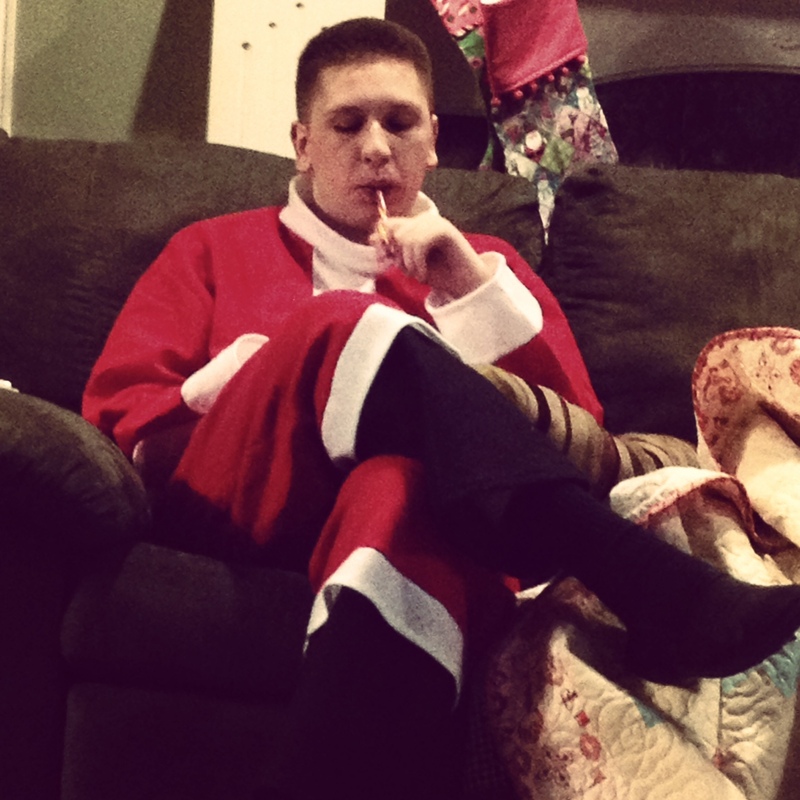 He played Santa for Allison at Christmas. Backpeddaling on a kids bike for a "seen at Walmart" pic, taken at midnight, of course. Oh he thinks he's the lady's man. 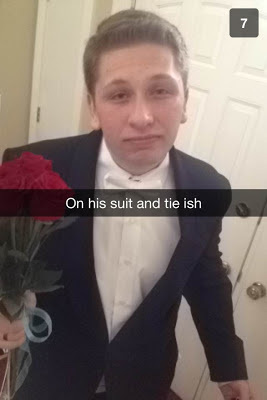 This photo was from prom. He went to nearly every single school dance at his school since he was 16. And all the girl's choice dances were with different girls. What do they see in him????? Humor is cute. I will say this is where he cost me bucks. Those dances are expensive and what is with the date at the game the night before, "day date" and then the actual date? We never did that. Graduation from Lone Peak High School at the end of May 2013. He's pretty proud of himself but you can see he still has braces. I think it kept him from kissing girls his junior and senior year. Here he is showing off his graduation quilt. I think he's happy with it. Not all the fabrics tell a story but most of them do. 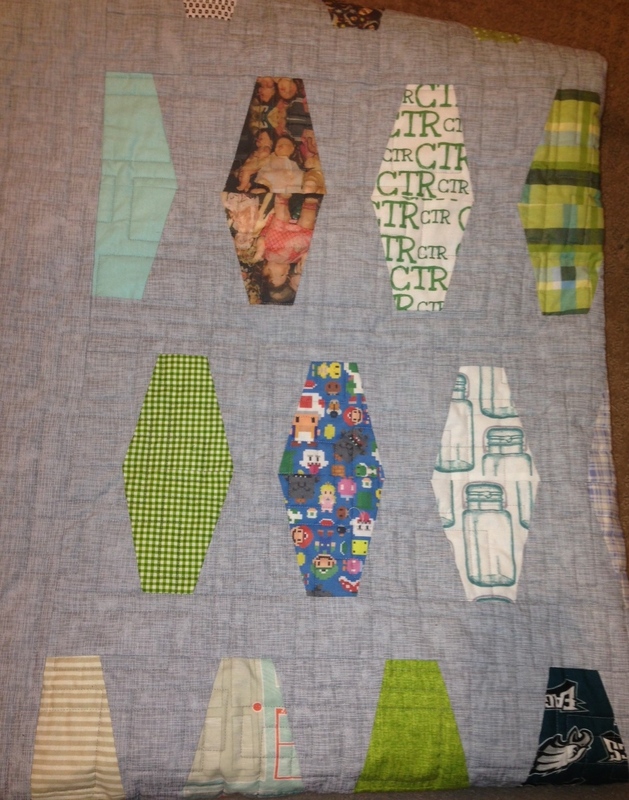 I even cut up some of his thrifted clothes and made blocks out of them. 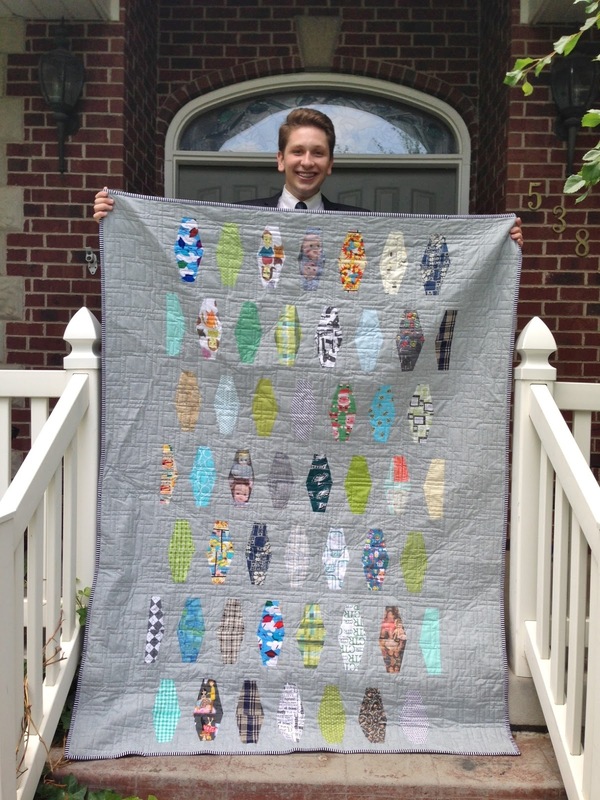 I know this quilt will help Mason remember his happy high school years. If you are in the USA, Happy Independence Day. 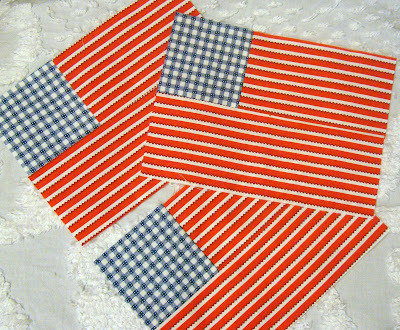 I love making flags. Where ever we live we all have a flag to celebrate our country. I have hand stitched the binding on this quilt for weeks so I'm really glad to finish it. It is 96X96 so you can see why it has taken solong. We aren't exactly having hand binding weather around here. We are having a heat wave of 100+. 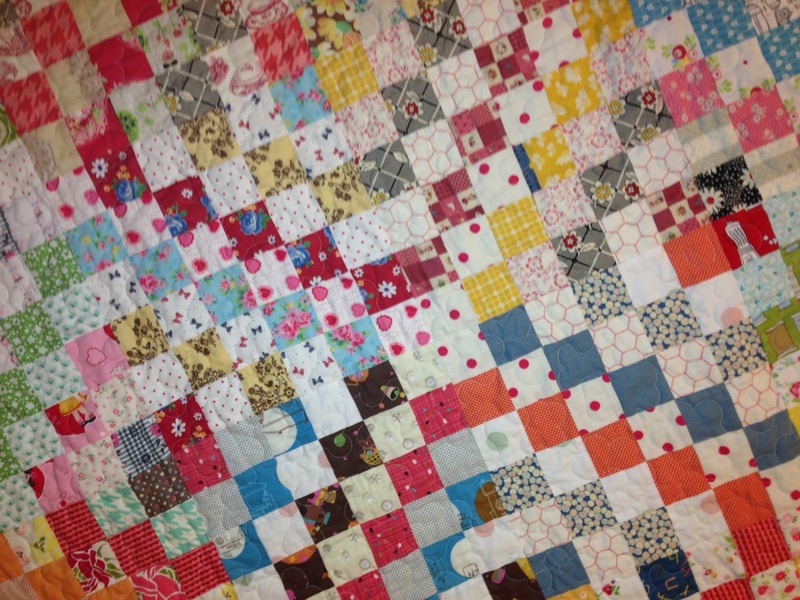 I know so many bloggers made the scappy trips quilt so it may be boring to look at mine. But I'm proud of it. I'm going to put this quilt on the upstairs guest bed. 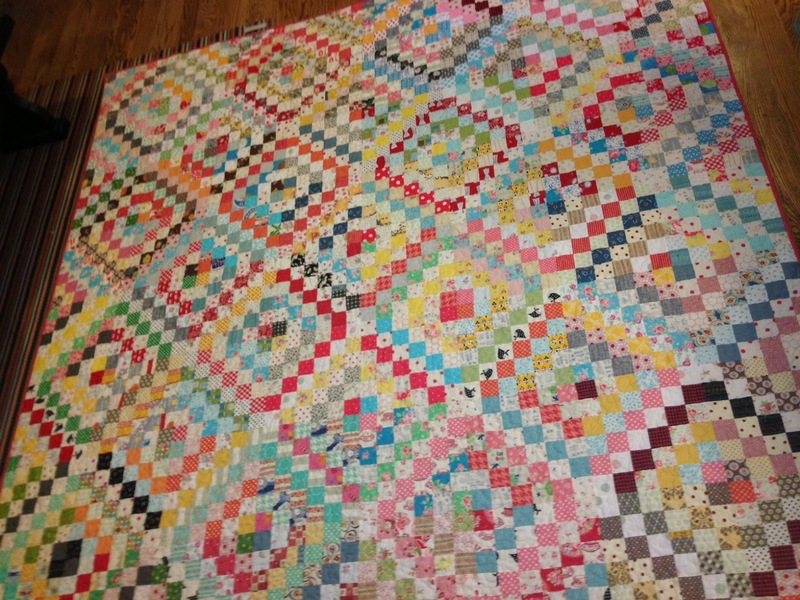 I think it makes a neutral quilt for an extra room. I tried to balance out light and darker or medium value fabrics so the trips were somewhat obvious, even though they are unplanned and scrappy. I used a blue backing with a red binding. This is the type of quilt I love. There is so many fun fabrics to look at and enjoy. 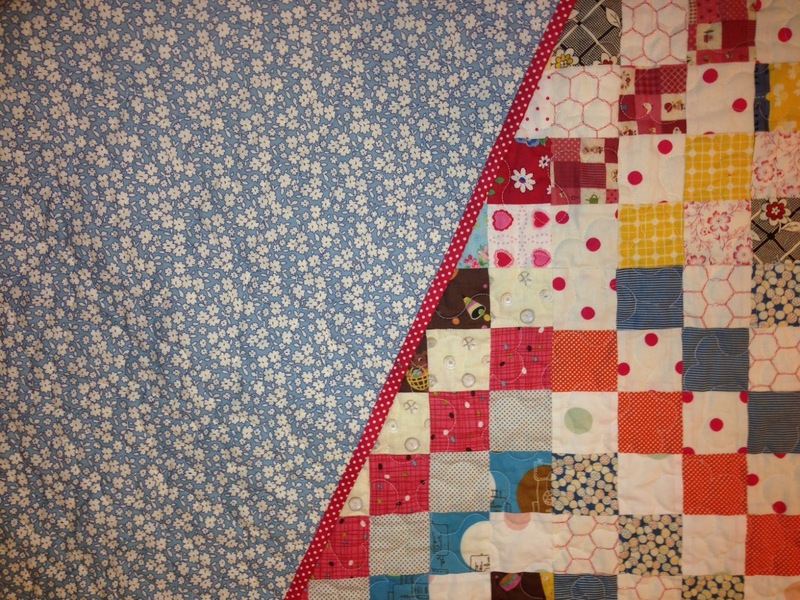 I'm working on binding my other scrappy trips quilt.